There is no better way to step into the New Year than by taking a major step back right into the heart of history. That is exactly what the travel agency, Responsible Travel, offers with its trip to Greece, which focuses exclusively on the mysteries of archaeology. Greece is where science, democracy, and a variety of art forms originated, and this archaeology tour takes travellers back almost 4,000 years, to a place that thrived with beauty and progress, way ahead of its time. Offering its customers the best of both worlds, the tour makes sure to treat its customers to the marvellous accounts and legends that came alive in the cities of Epidaurus, Sparta, and ancient Tegea. As for the present, the lifestyles of contemporary Grecian locals, along with their warm beaches and lush vineyards, are definitely not missed out on either. An eight-day trip that includes visits to Delphi, Acropolis, Tripoli, the Filosofou and Prodromou monasteries, and Ancient Gortys among other places, the trip certainly promises a historically and culturally rich getaway which would leave anyone with a sense of awe. Apart from the glacial attributes of ice, there aren’t many things that can be described as clean, pure, crystalline, and sleek all at the same time. And the moment one combines these characteristics with the business of luxurious vacationing, the result is both fascinating and exciting. Such is the case with the Icehotel, located in the village of Jukkasjärvi in Northern Sweden. A unique place to stay that pops up every winter in the Arctic, the Icehotel is comprised of ‘snice’, which is a mixture of snow and ice, mostly made from the Torne River. Blocks of ice, each weighing two tonnes, are harvested and stored from the previous winter in preparation for making the hotel. A form of hotel that collaborates heavily with artists for its creation, it takes up to six weeks to end up with glistening rooms, with their metre-thick walls and a slew of unthinkable amenities and attractions. 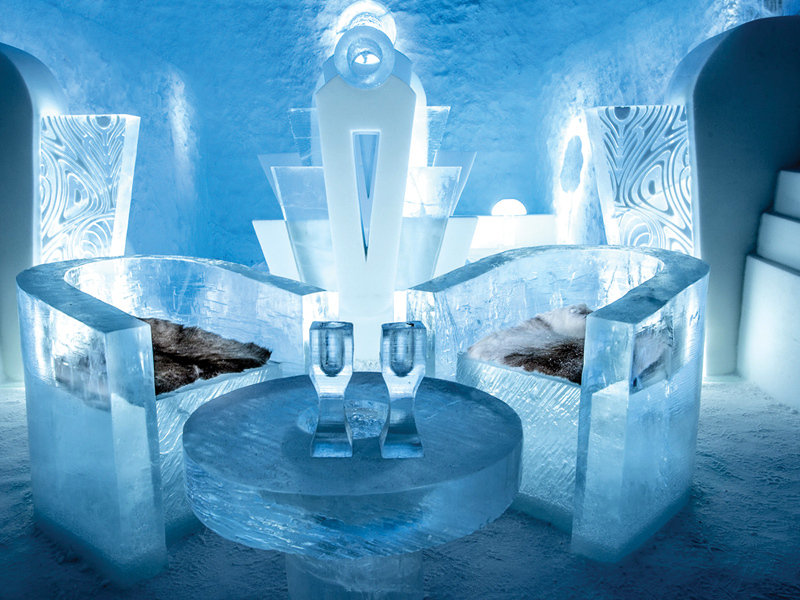 A few of the property’s many features and activities include the Ice Church, Ice Bar, Jukkasjärvi sauna, reindeer and dog sledding, ice-sculpting, and much more. A holiday destination that is truly something out of a fantasy novel, anybody’s curiosity about the Pamukkale Thermal Pools in Turkey is sure to get the best of them. Pamukkale, which literally translates to ‘cotton castle’ in Turkish, is also home to the ruins of Hierapolis, a Greek-Roman city from the second century BC and a UNESCO World Heritage Site. However, the reason hordes of tourists gather at this ivory attraction is for the country’s prime mineral-bath spa. 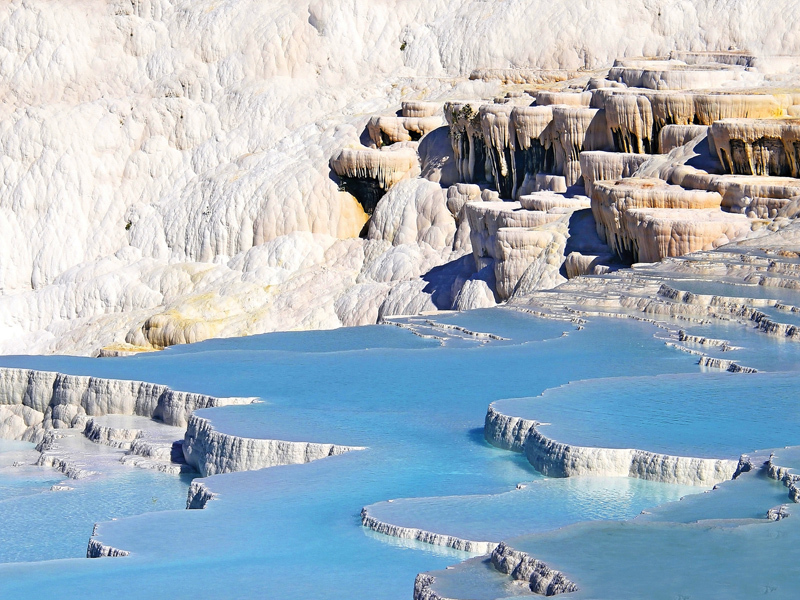 The picturesque terraces are made up of travertine, a sedimentary rock deposited by the water from the hot springs; it is formed by underground volcanic activity. While one can relish the sight of the well-maintained ruins right from the spot where the ancient Romans enjoyed the experience of the effervescent waters themselves, visitors can also reap the many benefits of these hot springs. The Pamukkale terraces have been known to be beneficial for the eyes and skin, and even improve conditions of asthma and rheumatism. The one thing that can make a long, winding hike through rocky paths any better is if the activity takes place in the company of a magnificent pack of Siberian and Alaskan Huskies. The Husky Trekking Tour, a holiday planned by the Responsible Travel agency, takes place in Finland and is a unique choice for a getaway. With the trek being led by extremely active and energetic dogs, the journey is definitely not for the faint-hearted. 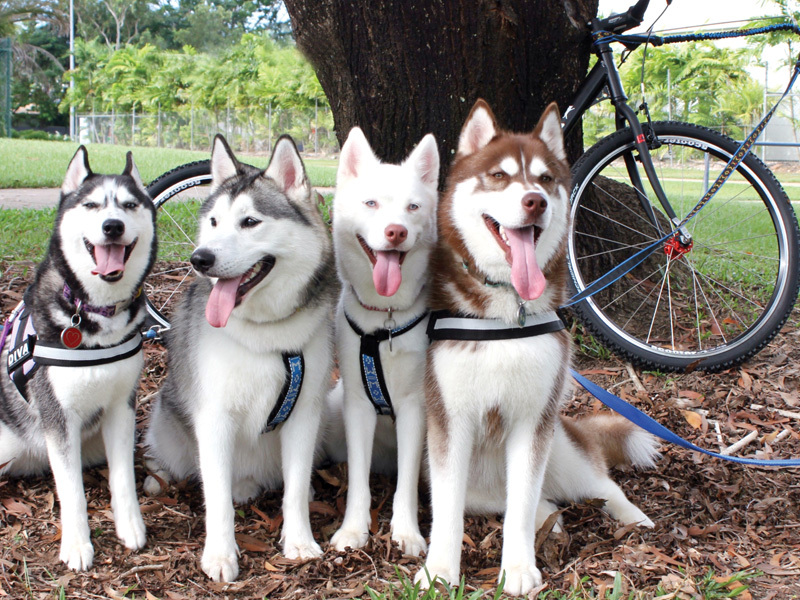 The long walk begins after visiting the lively Husky Farm, which houses 25 well-trained dogs, including Siberian and Alaskan Huskies, and Greenland dogs. Setting this trek apart from the rest are the pups themselves, as their keen sense of sight and smell gets them racing through the woods and at times discovering trails so deep in the forest that one might end up basking in the luscious lap of nature. Apart from their canine guides, travellers are also provided basic amenities and even special diets to suit everybody’s preferences. Moreover, they are even given time to engage in more serene activities such as fishing and, more importantly, helping groom their furry friends. There are those who might be satisfied with viewing the towering Himalayas from a great distance. And then there are the rest who will not be satiated until they experience the mountain range up close. Here to make that dream a reality is the boutique travel operator Remote Islands, which focuses on tours based in Asia – from the far reaches of Kazakhstan and Siberia to places closer to home like Oman and the Philippines. Apart from offering the experiences at the Everest Base Camp, travellers also get to touch base at places like Kanchenjunga, Lhotse, Cho Oyu, and Dhaulagiri, among other stops. 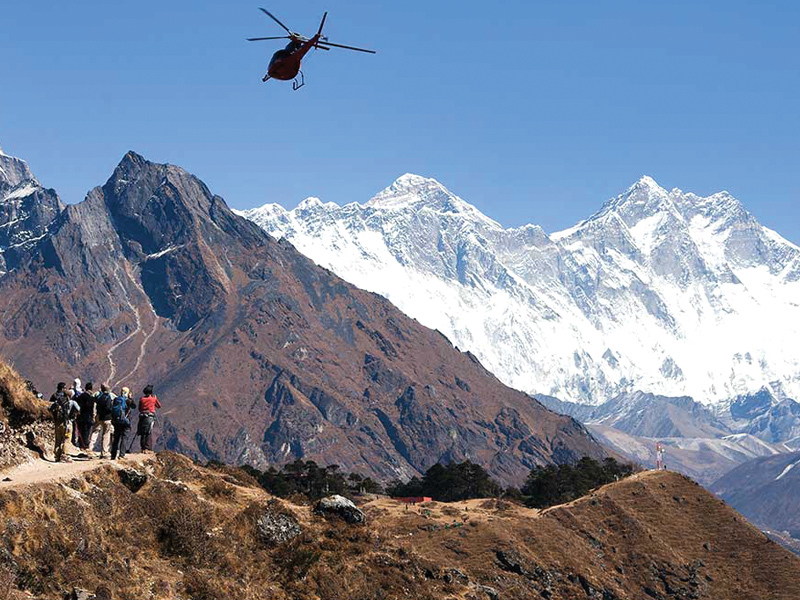 Here one can journey between destinations in a helicopter, in the company of an experienced sherpa, with comfortable accommodations in the mountains awaiting them at the end of every outing. Other than taking in the sights from celestial heights, travellers will also be able to tread among the residents of the Chitwan National Park on the elephant safari, plus visit the sacred and historic destinations of Kathmandu. Based in Catalonia and promoted by the Barcelona Provincial Confectionery Guild, Museu de la Xocolata, or the Chocolate Museum, offers a comprehensive journey into the world of chocolate, that definitely goes beyond just promoting its signature taste. 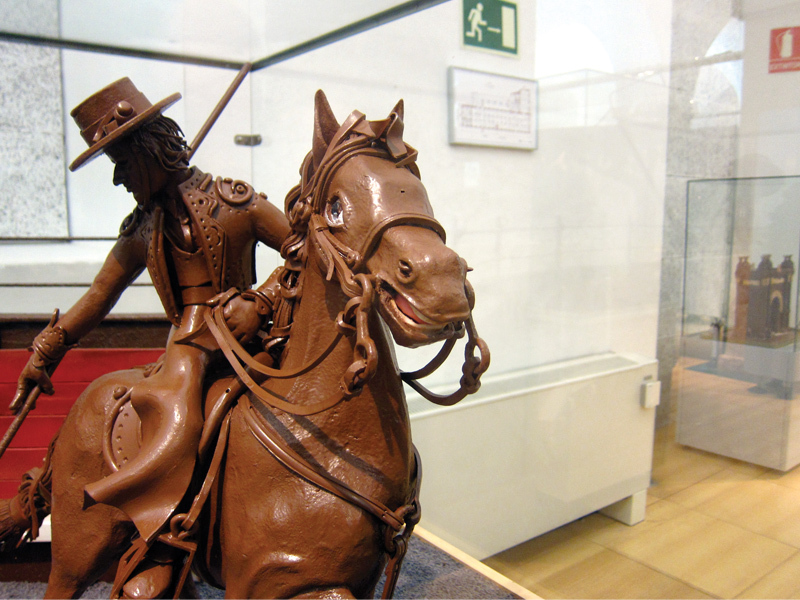 A museum that gets every visitor’s mouth watering right from the doorstep, the Museu de la Xocolata also focuses on promoting the medicinal properties of chocolate, along with its nutritional values, how it has changed since its discovery, and how it continues to shape the culinary world as we know it. Visitors are given a detailed explanation of the chocolate-making process – from how cocoa seeds are found and grown, its varieties, and how the final products are manufactured. Furthermore, their fun yet educational activities include teaching visitors how to make chocolate lollipops; demonstrating the basic techniques of handling chocolate; workshops that will turn one into a master chocolatier for the day; training palates to appreciate the exotic combination of wine and chocolates; and finally ending the day by taking in the exquisite and intricate chocolate figures in the museum’s Barcelona Room.